This Valentines, Swipe Right for Cadwaladers! This Valentines day enjoy Two for One Sundaes in all our stores! 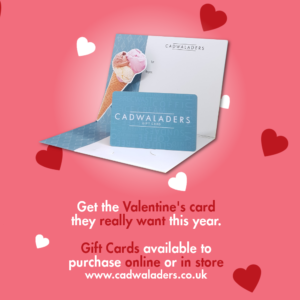 If you can’t be with your loved one this Valentines day, treat them to a Cadwaladers Gift Card. With picturesque locations and delicious treats for all types of diets it’s the perfect gift, they won’t forget! Purchase your Valentines Gift Card online today! At Cadwaladers we have so much to offer our customers, being family-friendly and dog-friendly* it’s the perfect place to head when organising your Valentines day plans. We also cater to all dietary requirements with Gluten-Free cones, cakes and Vegan (dairy and egg free) ice cream, sundaes, cakes and lunch options. Make your tummies happy with our Valentines day special with Two for One sundaes available in all our stores! For our vegan and dairy free customers we have launched our brand new vegan menu with a wide range of ice cream sundae and lunch options. Ask your server and they will be happy to assist and advise the best choices for you! * Red Dragon centre store is not dog-friendly but we are VERY family friendly!